← The Rest of the Story. . . . 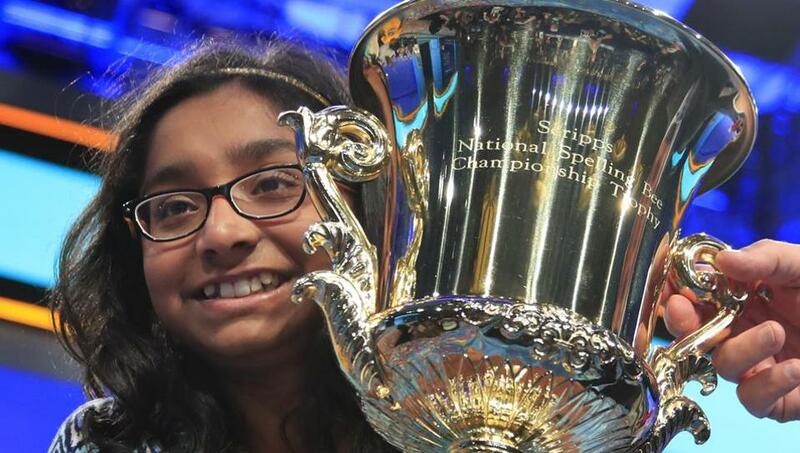 This is Ananya Vinay the 2017 Scripps National Spelling Bee champion. To be declared the winner, she spelled 35 words correctly in a grueling 12 hour time frame. Ananya is a tenacious competitor tying for the last three bees. This year she is the solo winner and won over 291 spellings to earn $40,000 in money and prizes. There is great curiosity as to the unprecedented success of Indian Americans. In 2016, seventy of the final 285 competitors of the National Spelling Bee had South Asian surnames. Indian Americans have also won the last 5 National Geographic Bees. It is remarkable, to say the least, that the record of successful competitions are dominated by a group less than 1 % of school age population. Indian people traditionally do well in math /science / engineering and have strong abilities in learning where memorizing is a strong component. Family is a key component in both nature and nurture. The parents of these children are highly educated, working in high level positions, and value competition, hard work in order to attain higher degrees. One of the contestants this year was following in her mother’s footsteps as a second generation spelling. Working hard and not giving up is another winning attribute. Ananya had tied as the winner for 3 previous years. This year she was the solo winner. These Indian American immigrants hunger for success in the United States. They work hard even to deprivation of other wants in order to attain that dream. Congratulation to Ananya and the Indian community. Thanks for your contributions and hard work teaching others by your inspiration and example. This entry was posted in awards, India, Uncategorized, USA. Bookmark the permalink. 2 Responses to And the Winner Is. . . . . Indeed it is remarkable !